** Originally published in The Crabbet Influence May/June 1989 issue and Collectors Vol. 1, 1992. 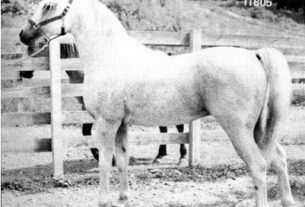 SKOWRONEK gray stallion foaled in 1908. Bred by Antoniny Stud, Poland. Skowronek was probably the greatest recorded Arabian sires of all time. His influence has been nothing short of amazing and spans much of the recognized modern Arabian horse breeding world. 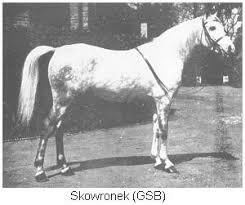 Skowronek was more than a prodigy as a sire. He was, fortunately, an individual of truly outstanding merit, quality, and type. He strongly fixed a beautiful, classic type in the gene pool of the breed. 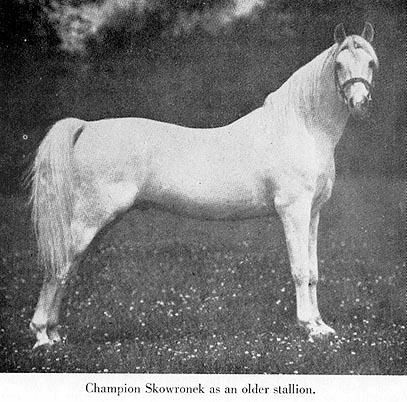 Circumstances of the early part of this celebrated stallion’s life were not planned or conducive to later greatness; it was mere chance that put Skowronek in the right place at the right time, thus enabling him to gain his justified and deserved place in the sun and in the annals of the Arabian breed’s history. There is some discrepancy about the foaling date of Skowronek. The Polish and English Arabian stud books show the year 1909, but the General Stud Book of England and the original Potocki pedigree list 1908, the date I use for his birth. Thus, Skowronek was foaled in 1908 – or 1909 – at Count Jozef Potocki’s important Antoniny Stud in Poland. There neither he nor his two full brothers seem to have been recognized as extraordinary; both of Skowronek’s full brothers were sold in 1914 to the Cossacs of the Caucasus mountain area of southeastern Europe. Skowronek, as a young horse. In 1920, when Skowronek was 12, Lady Wentworth acquired Skowronek and he eventually became almost legendarily famous. Mr. Clark always felt that Lady Wentworth purchased Skowronek by ruse. He seems to have sold the horse – whose potential he, himself, obviously failed to recognize – to an American agent for export, but the export order was canceled and Clark found Lady Wentworth the owner of Skowronek. Lady Wentworth must be given full credit for recognizing the touch of greatness in Skowronek and for providing him with his opportunity to prove himself. Up to 1920, when she acquired him, nobody in his life had fully perceived his worth to the Arabian breed. As for her manner of buying Skowronek – Lady Wentworth may have felt it was her only way to get the horse for, if Clark had known of her desire to own him, he may have taken a closer look at the horse for himself or may perhaps even have not wanted to let his rival Arabian breeder own Skowronek. In any case, Lady Wentworth’s purchase of Skowronek was a point of a bit of contention forever after between the two parties. Lady Wentworth later reputedly refused an offer of the equivalent of $250,000 for Skowronek from the Russian government. If true, this figure represented a lot more money in Skowronek’s lifetime than it does now. Lady Wentworth with her prized Arabian stallion, Skowronek. 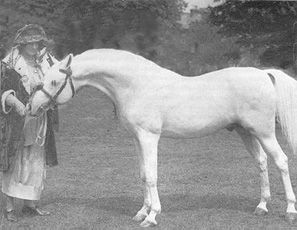 Lady Wentworth most frequently used Skowronek as a pedigree outcross which, because of Skowronek’s extreme and unusual prepotency, usually resulted in stock much improved in coupling, hindquarters, and hind legs. The Skowronek stock also usually showed the strong stamp of the Skowronek classic head and overall type. At the same time these dramatic improvements appeared in Skowronek stock, his get sometimes displayed somewhat shortened – although very well shaped – necks, shortened shoulders, and flattened withers; it was probably for those reasons that Lady Wentworth most often utilized Skowronek close-up in single lines only. She blended the good qualities of Skowronek with the good qualities of other Crabbet lines; this was done with great effectiveness and in that way Skowronek changed the character of Crabbet breeding in a positive and rewarding manner. The good effects of a cross to Skowronek were long lasting and highly visible even some generations away from Skowronek. Most of the countries which obtained Skowronek blood used it in the same manner as that developed by Lady Wentworth and with the same general results. The famous and influential Kellogg Ranch generally blended its Skowronek blood in this way with excellent results. Several other well known farms in several different places in the world did the same – for example, the Tersk Stud in Russia. It was only in the United States that some breeders developed programs based on multiple breeding to Skowronek. While many different American breeders made this interesting – and sometimes exciting – choice, probably the two most famous Skowronek close-breeding programs were those of Alice Payne and Dan Gainey. Mrs. Payne and Mr. Gainey put different emphasis on trait selection and individual base animals and as a result their end products differed. Mrs. Payne’s intensely inbred horses tended to often be more or less chunky, compact, and sturdy in appearance, while the Gainey stock appeared more refined and elegant with some individuals almost ethereal. Mrs. Payne used various Skowronek bloodlines available to her, but her strongest emphasis was on *Raffles. 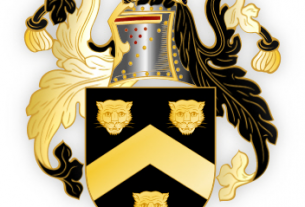 Mr. Gainey also used more than one source of Skowronek blood, but his main base was Ferzon 7723, a horse closebred to *Raseyn, mostly via Ferseyn 1381. Representatives of the Gainey program have gone to several different parts of the world. Today in the United States there are still several breeders whose programs feature Skowronek close-breeding and many beautiful animals are produced. The products of these programs sometimes go back into the same breeding plans from which they come, but they are often also utilized by other Crabbet/American breeders in the same way that Crabbet and Kellogg used Skowronek blood – as crosses to reinforce, introduce, or reintroduce the special Skowronek class and qualities, including the beautiful heads often seen in such breeding. Skowronek, himself, was the result of an outcrossed pedigree. He was the product of a desert bred sire crossed onto a very old Polish dam line. Ibrahim, sire of Skowronek, was a gray Seglawi Faliti foaled in the Arabian desert in 1899. Count Jozef Potocki purchased him from his agent in Odessa, in the Ukrain on the Black Sea, the agent having brought Ibrahim there by way of Constantinople, Turkey, from the Orient in 1907, when Ibrahim was 8. He was taken to Poland that same year. He was chief stallion at Antoniny Stud from 1907 to 1916. He was an attractive horse of small size; he was known as a good sire. The names of his desert bred parents are probably garbled versions of their strain names. With the transliteration and translation of the various languages involved, it is today not possible to figure out what strain name Heijer was meant to designate, but it is obvious that Lafitte comes from her strain name of Seglawi Faliti. Jaskolka, dam of Skowronek, was considered one of the best of the Antoniny mares. Her name means “the swallow”; Skowronek’s name means “the lark.” Jaskolka was a gray bred by Satanow Stud and foaled in 1891. Her name is sometimes seen misspelled “Jaskoulka” or “Yaskoulka.” Rymnik, sire of Jaskolka, was a gray foaled in 1876. Bred by Chrestowka Stud, he proved an important and influential sire of his time. He was known for his high quality. Derwisz, also gray, was foaled in the desert in 1858 – and taken to Poland in 1861 by Count Potocki after his purchase at Stamboul, Turkey. He was later owned by Prince Sankguszko. He is said to have been a small horse. Iliniecka, founder of Skowronek’s dam line, was foaled in the desert in 181? – and taken to Poland by Slawuta Stud in 1820. What was Skowronek like? I offer impressions of Skowronek from four different people. On August 26, 1922, when Skowronek was 14, E.S. Humphries wrote, “Count Potocki’s stud of Arabs was unfortunately dissipated during the war in Russia. Lady Wentworth’s stallion Skowronek came from this herd. He has a fine head and neck but no shoulders or withers and is not much in the legs.” Mr. Humphries was the manager of W.R. Brown’s Maynesboro Stud in New Hampshire and his opinion of Skowronek was the result of seeing the horse in the flesh. My own impressions are formed by the study of still photographs and the approximately 1926 vintage movie clip of Skowronek said to have been taken by Rudolph Valentino (the actual source of the movie clip is not known for certain). In the film the snow white Skowronek, probably 18 years old, is led along a path. When he stops he goes over at the knees. His neck sometimes looks a bit short, but his back, loins, hindquarters, and legs, except for the buck knees, seem superb. His neck appears set higher and better on his shoulders than I had previously realized. His head is seen as clean, dry, lean, breedy, and really quite different from the heads he put on some of his sons (as witness *Raseyn and *Raffles); his head is more like a masculine version of the heads of some of his daughters (for instance, *Rossana and *Raida). Still photos corroborate these things and, because we have photos from his prime as well as when he was older, we can discern even more about him. When he was younger, Skowronek’s head showed more of the look which he gave to some of his sons (*Raffles and *Raseyn). His face was extremely Arab looking – very wide between the eyes, tapering to a small muzzle. His large eyes were especially fine and dark, but his nicely shaped small ears did not stand up straight enough. The beautiful quality and naturally arched shape of his neck show in all the photos without exception, but it does look in some of them as though his neck could have been a bit longer. His neck was set on his shoulders high, in a very good manner. His withers were too flat and appeared more so when he was too fat. His shoulders were slightly short, but they were of ideal 450 slope and consistently measure so with a protractor. His back was excellent and his loins and coupling exceptionally good, strong, and smooth. His whole hindquarter area – croup, hip, pelvic structure – was truly superior. It was smooth, powerful, square, and absolutely correct. His tail was set up ideally high and carried in a splendid manner. His hind legs, from both side and rear views, were perfect. His front legs, from both front and side views, would have been perfect except for the buck knees. His feet were excellent as were his bone, tendons, and joints. The proportion and muscling of his legs were ideal. Skowronek was extremely classic in type. He stood 14.2 hands. The type, quality, and overall correctness of this horse ranked him as superior – a rare rating relatively few of even the most famous and best known modern major show champions and imports deserve. Skowronek’s truly outstanding features – classic type, head, eyes, neck, back, loins, coupling, hindquarters, and legs, particularly hind legs – far outweighed his relatively insignificant flaws of ears not standing up entirely straight, flat withers, and buck knees. In the end, perhaps the very best feature of all about Skowronek was his phenomenal breeding power – his ability to so strongly breed on his own extremely classic type and good features for generation after generation. One can only be puzzled by Mr. Humphries’ disparagement of Skowronek’s legs. Perhaps the highly visible, but relatively minor, flaw of being over at the knees caused him to quit looking and therefore miss the rare perfection of this horse’s legs in every other way. Skowronek’s shoulders were also not as bad as Mrs. Humphries’ harsh remark about them might lead one to believe; actually the shoulders of Skowronek were quite good and their ideal 450 slope highly desirable. Skowronek – this paragon among greats – died in February of 1930 at the age of 22. His skeleton was given to the British Museum in London. It showed 17 pairs of ribs and 5 lumbar vertebrae. From the above information, it can be seen that Skowronek had an 89% conception rate. 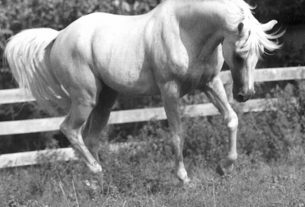 Skowronek was homozygous for the dominant gray factor; all of his foals were gray. 1935 mating of Skowronek grandson, Ferhan, to Skowronek daughter, *Incoronata 1200 – *Ferhanata 1202, foaled in 1936.